No unions or Low minium wage or no minium wage only increases the profits for the corporations and shareholders plus salaries for management of the corporations those few spend less reducing the amount on money in circulation the overall economy suffers. I can understand why minimum wage advocates think the way they do. The only problem is that their position is misguided. 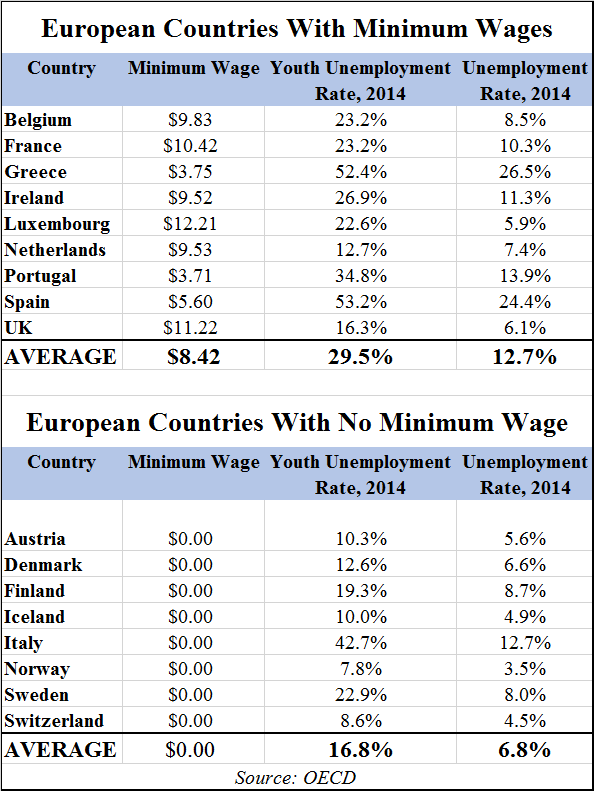 The problem with comparing the US with european countries with no minimum wage is that the unions have a lot more power in european countries. I’m from Sweden, and although we do not have any minimum wage controlled by law we do have “minimum wages” in the form of collective agreements negotiated by the unions. This is a system I think would be hard to implement in the united states, so comparing the US with european contries is harder than you make it seem. 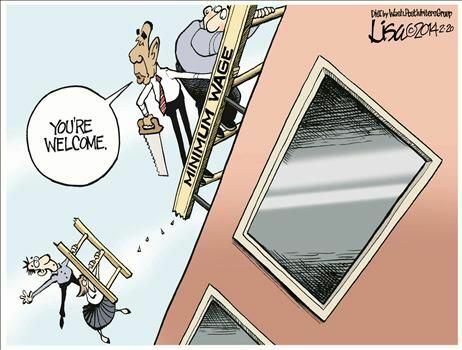 From the point of view of leftist politicians, increasing the minimum wage is a win-win. Some people will see their income go up because of the law, and will be grateful to the politicians who passed it. Others will lose their jobs because of the law, and will turn to the government for welfare benefits, and they will then be grateful to the politicians who support increased welfare, which is typically the same people who supported the minimum wage. When businesses point out the costs of an increased minimum wage, the politicians will denounce them as greedy, and use this as an argument for why we need more socialism, winning again. So a few million people lost their jobs? Minority teenagers are placed in a position where they can’t get a minimum wage job, and with no experience they can never get a better job, so they are trapped in unemployment forever? So what, as long as they vote Democrat? the Japanese have some pretty neat robots that could prepare and sell burgers… what will it take? 15 an hr.? 20? not a bad start-up idea…………………. In the leftist world, the higher wages compensate for the few jobs lost. And the less productive, less qualified and less ambitious also vote by majority. Nine vote to increase their hourly wages from $10 to $11 and the tenth loses his job. In a democracy who wins? The nine who gain a small benefit or the one who suffers the disproportionate damage? But higher minimum wages also kill other jobs. The higher cost causes your company to succumb to foreign competition triggering layoffs across the board, or even eventual company bankruptcy. Jobs then disappear at all levels. Sure many jobs have big inertia to being exported, e.g. truck drivers. But if those professions ask for compensation beyond their market equilibrium value, the distorted higher cost they impose will drive companies that directly and indirectly use their services into bankruptcy; especially those companies that are at the margin of losing their worldwide competitiveness. Other professions making more than minimum wage get laid off and then as new job seekers put downward pressure on other professionals. But the bottom line is that overall productivity, economic efficiency, and most important the compounding prosperity of higher economic growth all decline. In other words, you have taken yet another step towards making your country a middle income country by the latter part of this century. Then you will earn the true average wage. The average worldwide wage of the latter twenty first century (which BTW will still be much higher than today’s average American wage, but a miserous wage nonetheless by the standards of the latter twenty first century). Progressive city councils (Hello, Seattle and Los Angeles) and state governments (Hiya, California!) have a lot to answer for: pricing out of the job market the very people they claim to want to help — young people and the poor. The real cost of nominal wages is reflected by the marginal product of labor. i.e. This means that the employer will take employees at a higher minimum wage that are good at producing more for the same hours worked. As an employer, would you prefer to pay 7.25 an hour to someone who does a poor job or 15 and hour to someone who has an output of 4 times the average output of the 7.25 an hour worker? Additionally, lower income has a direct impact in consumer demand. In cases where workers make below C0 of the Y=Co+C1Y consumption equation, the government has to step in an this cost tax payers money. So a higher minimum wage is a trade off from tax payers maintaining C0 to workers becoming more productive in order to create greater output supporting both a higher wage and a higher consumer demand. One thing I rarely if ever see mentioned as an effect of minimum wages is illegal immigration. Minimum wage absolutely supports and encourages immigrants to come here illegally and work illegally. I am not saying that if the minimum wage was eliminated today that illegal immigration would stop immediately, but if you are an employer of illegal immigrants why do you employ them? Because they are cheaper than legal immigrants and citizens. If you could offer the same wage to someone legally allowed to work in the U.S. why wouldn’t you want to make it all legitimate? Then we can have a conversation about how to bring in other people in a legal manner that allows us to know who they are to fill any labor shortage. It would be interesting to produce a graph with two lines. One being the minimum wage over time. Intuitively, I’m thinking there is a correlation! Sadly.